SVIATOHIRSK, Ukraine -- The terrace under the big tent at the Pyramid Cafe in Sviatohirsk was nearly empty. The loud pop music that would normally blast away as Russian and Ukrainian tourists tucked into plates of kebabs and fresh forest mushrooms had been switched off. A few men sat around drinking glasses of beer and staring blankly or sharing gossip and smoking. In Sviatohirsk, food and hygiene products are piled at the Pyramid Cafe in Sviatohirsk, awaiting collection by IDPs escaping fighting in Slavyansk and other cities and towns across Donetsk and Luhansk provinces. In a neighbouring tent, people were absorbed by the screens of their laptops, reading the news or chatting quietly on Skype with family and friends still in the embattled city of Slavyansk. Near the kitchen, under a big umbrella sponsoring a Ukrainian beer company, a pile of donated humanitarian aid was slowly dwindling as people came by. Sacks of beets and potatoes leaned against cartons of laundry soap, heaps of toilet paper and bundles of clothes. Usually a summer playground of lakes, forests and a famous holy shrine and monastery complex, Sviatohirsk - or Svyatogorsk in Russian - has in recent weeks turned into a refuge for thousands of internally displaced persons (IDPs) fleeing the encirclement and bombardment of the rebel rallying point of Slavyansk. "Business is really bad, but we're focusing on humanitarian aid right now," said Irina, wife of Pavel Drozd, the owner of the Pyramid Cafe. "We want to help the people here, but our work is just a drop in the sea compared to what is needed." Indeed, by some estimates, there are around 15,000 IDPs in Sviatohirsk alone. Around 35,000 people have been displaced by fighting in Ukraine's eastern provinces so far, according to the United Nations refugee agency. From June 6-23, the number of IDPs in East Ukraine skyrocketed from around 2,500 to 35,000. As the Ukrainian army has tightened its encirclement of the separatist People's Republics of Donetsk and Luhansk, the UN High Commissioner for Refugees estimated on June 23 that around 19,600 IDPs have been created. The organisation estimates than an additional 15,000 IDPs remain unregistered, writing that "due to the lack of a centralised system of registration, the real figure of IDPs is unknown and is likely to be higher". Another 11,500 IDPs were created by Russia's annexation of Crimea, according to reports from local authorities and NGOs, the UNHCR said. And more than 5,000 people have applied for refugee status in Russia, according to the Russian Federal Migration Service. In total, the UNHCR believes more than 51,000 people have been displaced by the fighting so far, and has begun supplying aid to them. "People started to come here to the restaurant to use the internet. Then there started to be more and more of them. That was around May 1 - the first wave of the antiterrorist operation," said Pavel, the owner of the Pyramid, the cafe that has become the focus of the IDP support drive on the town's main street. "The biggest problem was people feeding themselves, because they were running out of money." 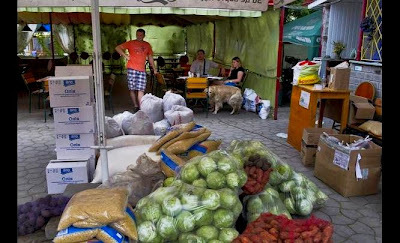 The mayor of Kharkiv agreed to help by ordering a notice posted on local television, telling IDPs they could pick up humanitarian aid at Pavel's cafe. "The next day people were already here asking how to receive it. There were about 300 people here that first day and we ran out of everything in 40 minutes," Pavel said. "Over the past five days we have distributed hygiene and food to some 1,500 people." Pavel, Irina, their three-year-old daughter Maria, and the family's golden retriever are now living in an apartment they rent in the town. They cannot return to their home in Slavyansk. In a way, they are IDPs themselves. "I understand at this moment that no one wants to help. But I think through my initiative people will be shamed into doing something," he said. "I am just helping people who have nothing." Some of the people fleeing the ongoing bombardment and skirmishes in Slavyansk escaped with little more than the shirt on their back and their passport. They have nothing now but an abundance of need, worry, confusion, and fear for the future. Besides material support, the people who come to the cafe also need reassurance, and Pavel is hard-pressed to give it to them. But I have no idea how to answer. You know, someone who knows the answers. But I understand that the people are suffering, so I always tell them, 'soon'. They think we know more than them, but we don't," Pavel said. "That's Semenivka. That's Semenivka. That's Semenivka," said Valeri Morozl as he flipped through picture after picture on his phone of destroyed houses in his village southeast of Kramatorsk, near Slavyansk. Moroz has been renting a flat in Sviatohirsk for nearly a month with his wife, two-year-old daughter and seven-year-old son. One of his two houses took a direct shell hit and was blown apart. The other has had all its windows blown out by Ukrainian army shelling. "We're doing nothing. We just sit here all day," he said, as he nursed a beer at the Pyramid. "I was laying in bed and you would here the boom of a shell being fired and you would wait there, counting the seconds to hear it land. It just wears on the nerves," the salesman said. "My son doesn't seem to be afraid. If my wife starts to cry, my son will start to cry but tells her, 'Mom, don't cry. Everything will be okay,'" he said. "But my wife just goes into hysterics immediately if something happens nearby. We were in the house and about 400m away a shell hit a house. I remember my shorts billowed up from the shockwave." Besides a shortage of shelter, clothes and food, the terror of the past few weeks has left its mark. "Every night there is a bombardment," said Stanislav, a relative of Pavel who helps by cold-calling people and telling them about the humanitarian aid available. "If a young kid has to spend two months like that, they will suffer irreversible damage. So, a question: What are we supposed to do for them? It's a catastrophe." Down the road and through the woods, the Iskra summer camp had no beds to spare. Some people even slept in the guardhouse. Shafts of late afternoon sunlight pierced the boughs of the pines while under a big blue tarp, men skewered meat for kebabs. Little kids ran around, shooting toy guns at each other. Women sat at a table and talked with neighbours about the news. It almost looked as it would have last year, full of holidaying Ukrainians and Russians. But all 120 of these people were from Slavyansk - staying at no cost through a social fund run by Rinat Akhmetov, a regional pro-Ukrainian oligarch. Oleksander Kurilenko sat at a white plastic picnic table as his mother set out a simple dinner of rice and chicken. Next to him sat Karina Ivanovskaya, his fiancé. Next to her sat Kurilenko's 89-year-old grandmother. Staying in the next room of the duplex cottage was his future mother-in-law and his wife's twin sister. There were six people sleeping in two rooms. "Our wedding was supposed to take place on June 14. Now we don't know when it will be," he said. "She's been planning the wedding for six months now. She's got her dress and everything for it here. But we want to go home and have the wedding there. We hope we will go home. Tomorrow will already be two weeks." They are not rich, and were planning to spend their honeymoon in Yalta, a resort town on the Crimean peninsula, now a part of Russia. Now they are here, at this summer camp in the woods, with no clear idea of their future. "If there will be peace in the region, then everyone who has fled will go home. We will all rebuild our houses," Kurilenko said. "We didn't have water for about five days, and then the lights went out." That's when they decided to leave. At the camp, at night, there is little to do but talk, read the news, worry and talk to friends still in Slavyansk. "We call our family members to find out what's going on," he said. "The most common question is, 'Are they shooting, or are they not shooting?' We ask if there is water." "We want to go home," said Ivanovskaya, his fiancé. "I don't want to live anywhere else. I want to go home."